Redsn0w is a popular jailbreaking tool developed by the iPhone Dev Team. iPhone Dev team had released Redsn0w 0.9.6b4 quite sometime back, which allows iPod Touch users to jailbreak iOS 4.2.1. In this guide, we will take you through the step by step procedure to jailbreak iPod Touch 4G, iPod Touch 3G and iPod Touch 2G on iOS 4.2.1 using Redsn0w. Here are some important points to note before you proceed. This guide is meant for iPod Touch 4G, iPod Touch 3G, iPod Touch 2G non-MC model users only. Please note that jailbreaking your iPod Touch may void your warranty and hence proceed with caution and at your own risk. Do not forget to backup your iPod Touch before you proceed. You can refer to this post for instructions on how to backup your iPod Touch. Please note that this guide is only meant for Windows users. We will publish a guide for Mac users shortly. After the jailbreaking process is complete, do not forget to checkout our article on tips to keep your iPhone secure. Please ensure you are running latest version of iTunes, iTunes 10.1 or later. Please note that Redsn0w 0.9.6b4 can only perform a tethered jailbreak on iPod Touch 4G and iPod Touch 3G. Tethered means that the jailbreak needs to be reapplied every time you power down your iPod touch. If you let the battery run out or restart your iPod touch then you will need to reapply the jailbreak by connecting to your computer (tethering). iPhone Dev Team has recently released Redsn0w 0.9.7 that will perform an untethered jailbreak on iPod Touch 4G on iOS 4.2.1 but it is currently not ready for the general public. Redsn0w 0.9.6b4 cannot jailbreak iOS 4.2.1 for iPod Touch MC model. This guide is only applicable for iPod Touch 2G non-MC models. Step 1: Download Redsn0w 0.9.6b4 by clicking here and save the application in a folder named “Pwnage” on your desktop. Step 3: Double click the Redsn0w zip file and extract the application to the Pwnage folder. Step 4: Connect your iPod Touch to the computer, which should automatically launch iTunes. Step 5: From the ‘Devices‘ section on the left pane of iTunes, select your iPod Touch device. Now, hold down the Shift button and click the ‘Restore‘ button. Step 6: Navigate to the Pwnage folder on the desktop and select the downloaded iOS 4.2.1 firmware file (iPod Touch 4G users: iPod4,1_4.2.1_8C148_Restore.ipsw, iPod Touch 3G users: iPod3,1_4.2.1_8C148_Restore.ipsw, iPod Touch 2G users: iPod2,1_4.2.1_8C148_Restore.ipsw). Click on the ‘Choose‘ button to let iTunes update your iPhone with the required firmware. Step 7: Navigate back to the Pwnage folder and launch the Redsn0w application. Step 8: You will be asked to select the corresponding IPSW file. Click on the Browse button and select the iOS 4.2.1 firmware file (iPod Touch 4G users: iPod4,1_4.2.1_8C148_Restore.ipsw, iPod Touch 3G users: iPod3,1_4.2.1_8C148_Restore.ipsw, iPod Touch 2G users: iPod2,1_4.2.1_8C148_Restore.ipsw). Step 9: Redsn0w will verify the firmware file and inform you if it has successfully identified it. Click on ‘Next‘ to proceed. Step 10: Redsn0w will now start preparing the jailbreak data. Step 11: You will now be prompted to select the jailbreak options you would like. A few of these may have already been selected by default. Make sure Cydia is selected and select ‘Next‘ to continue. Step 14: Your iPod Touch should reboot now. Step 15: Redsn0w will now begin uploading the new RAM disk and kernel. Step 16: You will now be notified once the jailbreaking process is complete. Click on the ‘Finish‘ button to exit the application. Step 17: Your iPod Touch will reboot once again (which could take approximately 5 minutes). After it has rebooted, your iPod Touch should be successfully jailbroken. You should find Cydia jailbreak app on your iPod Touch’s home screen. iPod Touch 4G and iPod Touch 3G users should select Just boot tethered right now from the options window and click Next to use Redsn0w to help you boot back into your jailbroken device on every reboot. Hope this helped. Please don’t forget to drop us a line to tell us how it goes. 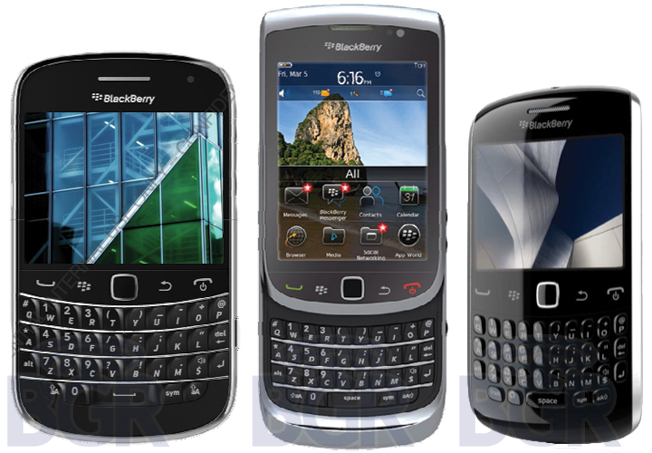 Exclusive: CDMA BlackBerry Roadmap 2011 – Montana, Monaco, Sedona, Malibu, BlackBerry 6.1 Evolution and more! we could see GSM releases sooner than the CDMA timeline above… plus things often change from plan. In the last couple of weeks we’ve learned a lot about RIM’s 2011 BlackBerry pipeline thanks to a handful of device leaks. After months (and in some cases over a year) of speculation, we saw specs and renderings show up for the dakota (touchscreen GSM Bold), monaco (aka Storm 3, though possibly will not fall under Storm branding at launch), Torch 2 and apollo (new curve). All that was followed by rumors of another Curve, sedona. Despite the windfall, what we’ve been looking at only told about 65% of the story. Today, thanks to a whack load of CDMA carrier roadmap slides, we can further fill in the gaps and clarify the codenames and even product names of what’s coming up in 2011, including an entirely new device that really hasn’t been touched on yet (Curve Touch!). On the BlackBerry 6.1 front, beyond what we learned at DevCon Asia, we can see some of the other goodies coming our way. Included in the update is a faster user experience via “liquid graphics”, a faster web browser experience (thanks to hardware acceleration and more mhz in the new devices), more homescreen customization options and even voice-activated universal search. All in all, things are really starting to make sense and look good! There’s plenty to look at below, so keep reading and be sure to sound off in the comments with your thoughts! Exclusive: BlackBerry montana is CDMA BlackBerry Bold Touch – Image and Specs! 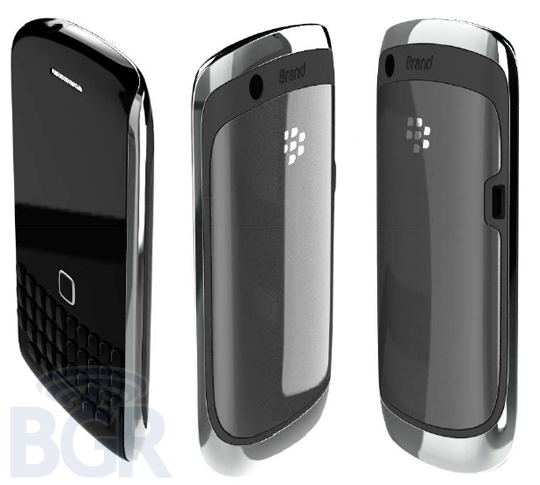 All in all, if you like BlackBerry Smartphones with keyboards and are on a CDMA carrier, this will be the device to have! Oh, hello. A trusted tipster just sent in these internal renders of HP / Palm’s “Topaz” webOS tablet, which is one of two tablets currently being developed in Sunnyvale. That’s right, two tablets: the 9-inch Topaz and a 7-inch model codnamed Opal — a lineup that fits nicely into Palm’s “Something big, Something small, Something beyond” tagline for its upcoming February 9th event. Looking at the render, we’re seeing the no-button design we’d previously heard about (we’re assuming the gesture area rotates with the display), a front-facing camera, a micro USB port on the bottom, and what appears to be a Vizio Tablet-style three speaker arrangement for stereo audio in both landscape and portrait modes — that’s two speakers along the left side and a third on the right. (That’s just a guess, though.) We’d also note the back appears to be a glossy material, which might rule out a giant Touchstone for charging — Touchstone backs have heretofore been soft-touch, but anything can change, we suppose. We’re told that units will start to arrive at Palm HQ in June as production ramps up for launch later this year — a timeline backed up by an internal marketing slide we received that lists WiFi-only, AT&T 3G, and Verizon LTE versions of the Opal arriving in September 2011, and on AT&T LTE in July 2012. The slide also indicates the Opal will have a particular e-reading focus, which makes sense for a 7-inch device, and there’s a mention of “premium audio,” which nicely reinforces our speaker hypothesis. Unfortunately, we don’t have any word on specs or pricing yet, but these things had better be packing some serious heat for cheap if Palm is really planning to wait until September to launch them — they’ll be going head-to-head with the Xoom, the PlayBook, and presumably the iPad 2. We’re still digging for more, so keep an eye out — things are going to get crazy leading up to February 9th. Update: We’re told that they both have unspecified 1.2GHz processors, and that Topaz may arrive before Opal. We’ll let you know if we learn anything else. We love all the little goodies that come out of iOS developer builds. It’s been only a day since 4.3 hit the scene and already we’ve seen hints of future iPhone / iPad models, a Find My Friends feature, and now more hints of a camera for the next iPad. Which, of course, is far from the first time we’ve heard iPad and camera in the same utterance (cases, mockups, paperwork, even more code). 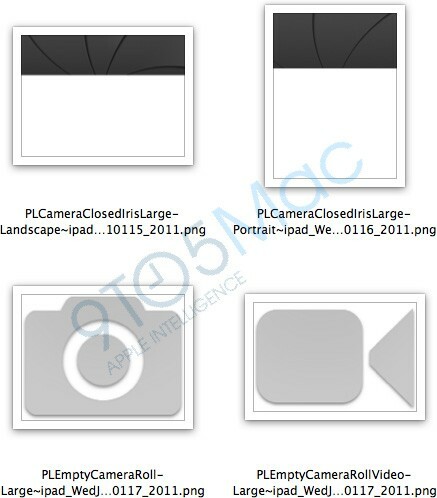 Today’s revelation comes in the form of shutter screens and camera / video icons care of 9 to 5 Mac, but here’s the catch: to believe these imagery to be the real thing is to also accept that the iPad 2 might have the same 1024 x 768 display, given that’s what these pictures are optimized for. You didn’t really believe the iPad 2 would have a 9.7-inch, 2530 x 1897 resolution retina display… did you? Well, it’s only speculative, anyway. We unveiled nearly all of RIM’s 2011 lineup over the past day or so, and we wanted to highlight the devices as well as give you a bit more background and personal thoughts on them — and of course, more photos. For starters, though, let’s talk about RIM’s NFC implementation and its real world use cases… we have been told RIM is planning to use NFC for pairing and streaming control with accessories, in addition to peer-to-peer information exchange. What does that mean? Well, you’d hold up one BlackBerry to another BlackBerry to add that person on BlackBerry Messenger, transfer your vCard information, or even share files. Future NFC uses headed to BlackBerry devices, we’re told, include things as crazy as building access control (no more key cards! ), ticketing, and of course, payments. Hit the break for the rest of our break down! 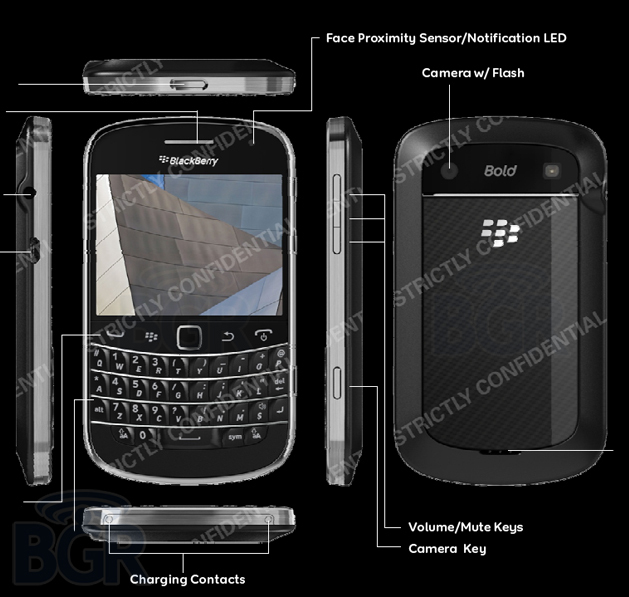 The BlackBerry Dakota is the creme de la creme of the 2011 BlackBerry family, and it will carry the Bold name. RIM has taken various shots at this form factor and the Dakota will be the first one to see the light of day. We’re glad the company took the time to get it right, because earlier prototypes we’ve seen definitely fell short. The Torch is a great phone for some, but those of us who live and die by the perfect QWERTY keyboard found on RIM’s Bold line had trouble dealing with the thin plastic keys and minimal tactile response on the Torch’s board. Beyond the heaven-sent full QWERTY / touchscreen combo, the Dakota will feature specs that are definitely a solid bump over today’s Bold devices. By 2011 standards they’re not going to blow anyone away, but higher display resolution, RAM upgrade, NFC, mobile hotspot capability and thin form factor are sure to please the eager BlackBerry-toting masses. Toss HD video recording and OS 6.1 into the mix, and we’re looking at the likely king of Waterloo in 2011. The BlackBerry Curve sits lower than the Bold on RIM’s device lineup totem pole, but with the newest Curve ready to debut later this year, people will be in for a treat. With a decent screen, HSPA, a 5-megapixel camera, and an 800MHz CPU, the brand new BlackBerry Curve definitely won’t be a slouch. The styling flows very well on the Curve pictured above with smooth angles and… curves. The phone also appears sleek and perfectly proportioned. RIM’s Curve line is by far its biggest, and we think this update will definitely help keep RIM’s enterprise sales moving in the right direction. 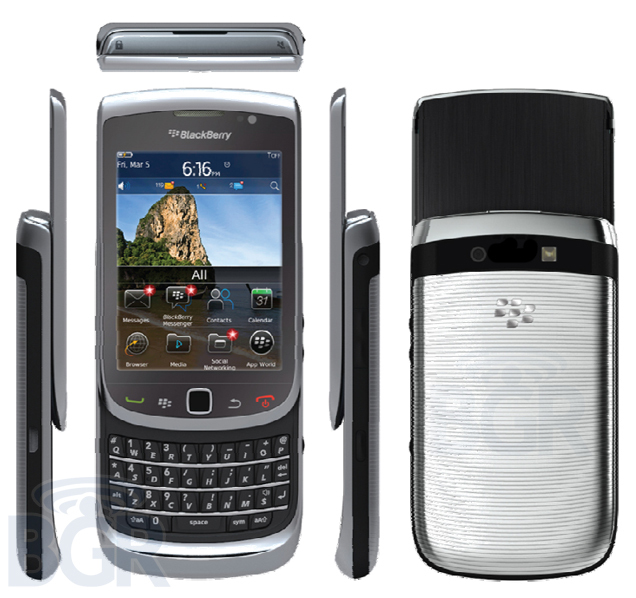 RIM called the first Torch its best BlackBerry ever, though many would take issue with that statement. The Torch did nothing for me, personally. In fact, all it really did was make using a BlackBerry device more clunky and painful. Part of this is the hardware’s vertical slide out design, but part of it was due to the slow processor and weak internals. But if all goes according to plan, one of the Torch’s two big strikes will soon be taken care of. The BlackBerry Torch 2 should scream with its 1.2GHz CPU, VGA-resolution screen and large built-in storage. Again, these specs aren’t going to make anyone’s head spin in Q3 2011, but they’ll definitely give the Torch the shot of adrenaline it so desperately needs. We have not confirmed that the BlackBerry Monaco will launch with the “Storm 3″ moniker, though if it did, it would be practically nothing like the first device in the series. The first BlackBerry Storm, internally referred to as an “Apple Killer” and arguably one of the worst handsets ever to created by Research In Motion (remember how we reported it would be terrible before release? ), shares nothing with the upcoming BlackBerry Storm 3 — no SurePress screen, no clunky hardware, no slow processor. This new full touchscreen device will be powered by a 1.2GHz CPU and feature the highest resolution display to ever ship on a BlackBerry — 800 x 480 pixels. We’ll have to see how it plays out in the marketplace, though, because by the time it is released in Q3, there will be much, much more advanced handsets with much more robust operating systems. The battle between the tablets is about to begin. With the success of the Apple iPad and tablets looking to become a $40-billion industry, other tech companies are starting to jump on the tablet bandwagon. The next tablet to be released is the Samsung Galaxy Tab, and shortly thereafter the recently announced BlackBerry PlayBook. Research In Motion has stepped out of their comfort zone with the PlayBook and it’s looking like a smart move. However, as with any BlackBerry product, we take an outside approach to its performance, functionality, comfortability, and interoperability when paired against the competition. We have taken the known specs of each tablet device and compared them to give you an unbiased look at which tablet may be the victor. There is no doubt that the Apple iPad has been a huge success. There have already been over 3 million units sold since its April 2010 launch. While sales may be high, does it mean that it is the best? The iPad is said to perform as a giant iPhone, but lacks a camera and may be a bit uncomfortable in size. Due to its popularity and basic OS as the iPhone, the iPad has many apps, games, and more. The amount of content available for a product generally helps it sell better than products without solid developer support. This has been key in leveraging the iPhone and now iPad against its competition. Currently, the iPad runs iOS 3.2, but will be upgraded to iOS 4.1 in November 2010. 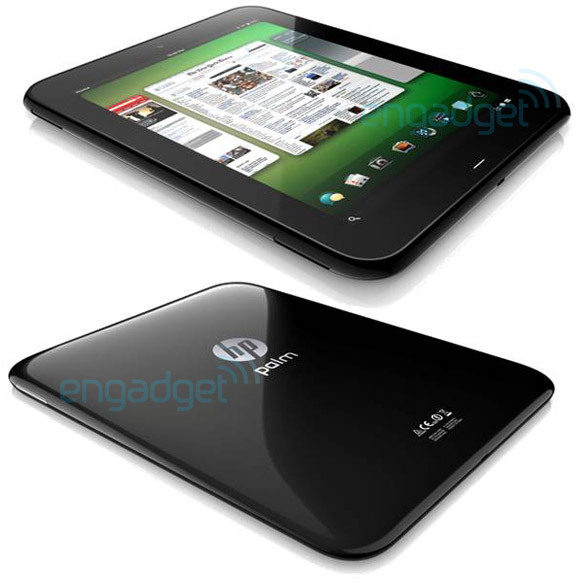 The Samsung Galaxy Tab will be the first tablet to launch and run Android 2.2 (Froyo). The Galaxy Tab will also be the first tablet to launch that will have a front and rear facing camera. It will have a microphone so as to allow you to make phone calls, and will also be useful during video conferencing. 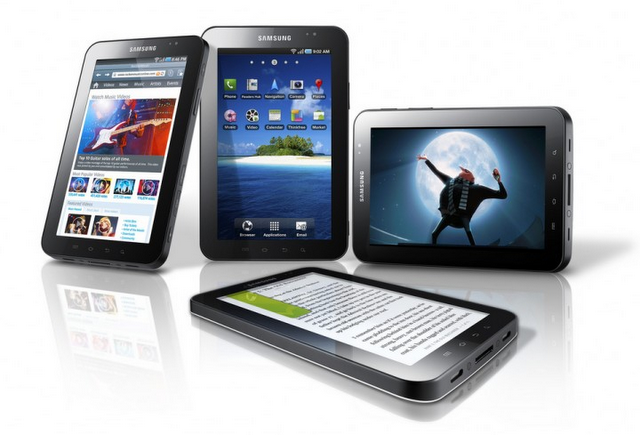 The Galaxy Tab will be the smallest tablet on the market at the time of its release. Android has been a huge success with its easy integration of Google products. The Galaxy Tab will be able to download apps from the Google Marketplace, many of the same apps or games you could on any Android phone. Samsung also plans to make Galaxy Tab specific apps, which should really enhance the user experience. The Galaxy Tab will have Adobe Flash 10.1 support, where the iPad lacks this. 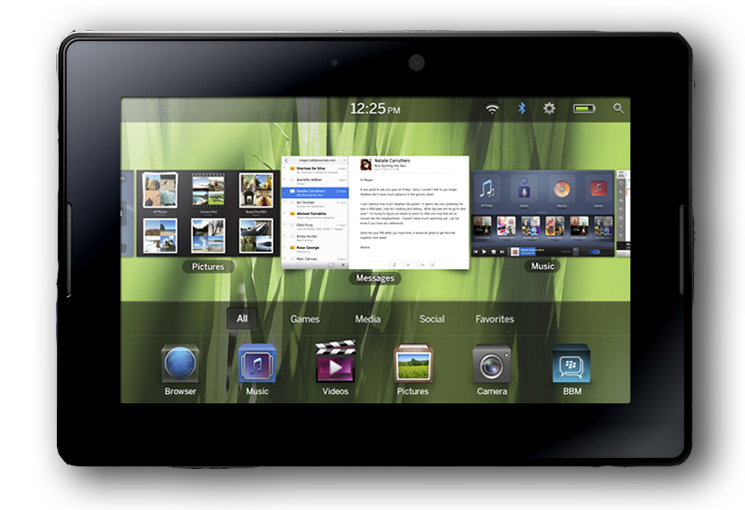 Research In Motion has officially confirmed the rumors by announcing the BlackBerry PlayBook tablet at DevCon 2010. RIM has been seriously lacking in hardware performance in their smartphones, when compared to their competition. Many people were blown away by the announcement on the specs for the PlayBook. Even more, RIM announced that the PlayBook would run the QNX operating system. QNX gives the PlayBook a whole new suite of features and functions that the original BlackBerry OS could not match. 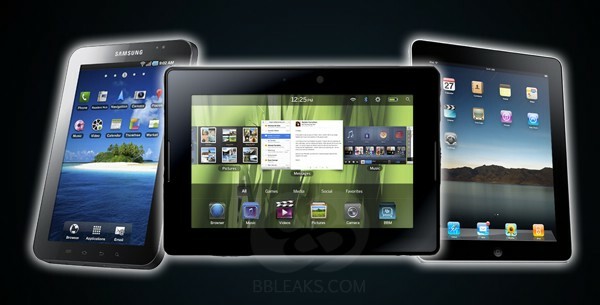 From the renders we’ve seen of the QNX OS on the PlayBook, it looks on par with that of Apple’s iOS and Google’s Android. However, even though the QNX OS will have great developer support and interoperability, many fear that the PlayBook will lack apps when launched. Current BlackBerry app developers will have to learn an entirely new system to develop apps for the PlayBook, so it could take some time. Adobe will bring Flash 10.1 and AIR to the PlayBook. The PlayBook, when launched, will be the only tablet to have Adobe AIR. 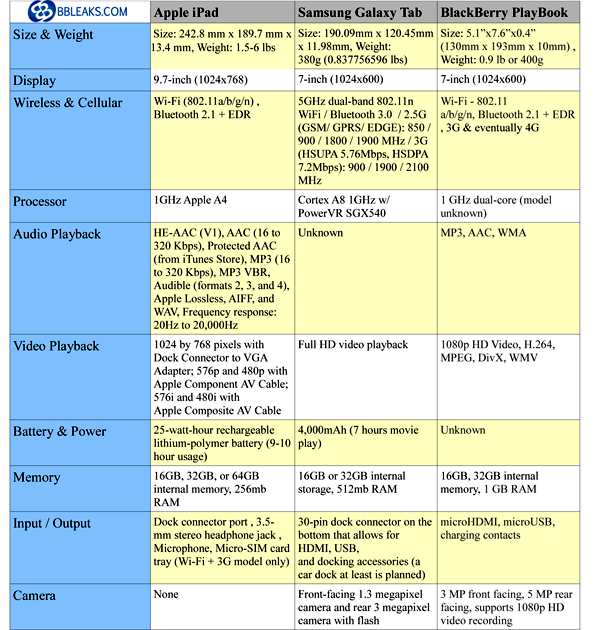 Below is a comparison chart between all three devices. At the bottom is a synopsis of the data. The iPad is the leader in size, but is bigger always better? It is said that the size of the Galaxy Tab and PlayBook are more efficient and comfortable to carry around and use over the iPad. The Galaxy Tab is the lightest with the PlayBook very close behind. The iPad has a nice large display, but again the size may be a negative aspect compared to the Galaxy Tab and PlayBook. The iPad and PlayBook both have the same WiFi bands, but the Galaxy Tab will only support one n band. However, the Galaxy Tab makes up for it by offering Bluetooth 3.0 over the 2.1+ EDR that both the iPad and PlayBook have. Currently, the iPad only supports 3G. Whereas, the Galaxy Tab supports 2.5G/3G and PlayBook will support 3G and 4G. The PlayBook will advance in this area once a 4G model is offered, especially if it is on Verizon’s LTE network. While all three tablets sport a 1GHz processor, it is hard to say which one is the fastest. It was definitely a surprise to see the PlayBook offer one with dual-core. All three tablets should be able to support the same audio playback. While we are unsure of the Galaxy Tab’s video playback, out of the three the PlayBook appears to be the leader with 1080p. The iPad leads in battery and power, but we’re assuming this is only the case because it can hold a larger battery. It is unknown what the battery life will be for the PlayBook. When it comes to internal memory there is one more option for the iPad over the other tablets. However, where it lacks severely is by only having 256mb RAM. The next runner up is the Galaxy Tab with 512mb RAM, with the leader being the PlayBook at 1GB RAM. Many times a lot of RAM is not needed if the operating system on a device runs light. Either RIM wanted to really beef up the PlayBook or the new QNX OS is a bit hefty and will require the added RAM. It is too early to tell, but needless to say if QNX is as light as RIM says, than the extra RAM is a win. It is still too early to really declare who the triumphant victor is in the tablet wars. We wanted to lay it all out and let you, the consumer, decide which tablet looks the best. Although, we must say, right now the BlackBerry PlayBook is looking awfully good, with the Samsung Galaxy Tab trailing right behind. If Research In Motion doesn’t screw things up, they may actually have a solid device against their competition. Which tablet do you believe will be the best?